10 and 15 Remarque Editions Available - this is a unique opportunity to own original art work created in the margins of the print. 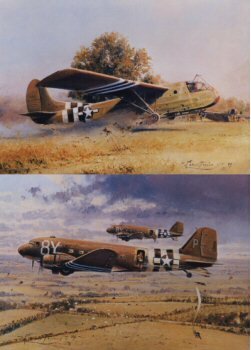 Each print in the Remarque Editions is additionally signed by three veterans who jumped into Normandy on D-Day with the famous 101st Airborne Division. Also available: own an original, custom remarque, created to your specification across the entire bottom margin of the print. Publisher’s Proof Gicleé Edition Available - please call for pricing. It began shortly after midnight on 6 June 1944 when two American and one British Airborne Division started to drop en-masse into Normandy. Their mission: to secure the flanks for the mighty amphibious armada heading towards the invasion beaches. As dawn broke to reveal the bullet-swept beaches below, overhead the skies were still filled with troop-carrying aircraft towing gliders heading for the drop zones. 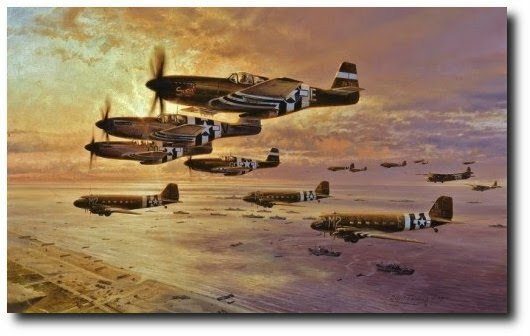 Robert Taylor’s iconic masterpiece D-Day - The Airborne Assault has been hailed by many leading veterans as the most realistic portrayal of D-Day air events rendered by any artist. Seen crossing a section of the invasion beaches, and closely escorted by P-51Bs of the 354th Fighter Group, C-47s of the 438th TCG tow CG-4 Waco gliders bringing in yet more reinforcements for the 82nd Airborne Division.